Louise Goffin, whose pedigree is well known, will officially release a digital single and video, “Revenge” on October 20th. The bar was high when she first embarked on a solo career in music. Having the Brill Building legends, Carole King and Gerry Goffin, as her parents created industry expectations that could be hard to live up to. But, Goffin has done just that with uncommon grace, class and originality. She has become her own wealth of song treasures. Her legacy reveals her to be a virtual Brill Building unto herself. The video makes use of black and white stills of the artists with the interchange of comic strip art to tell the story. The video contrasts with the tragic theme of de-humanization, with a light-hearted tone that creates irony and humor. 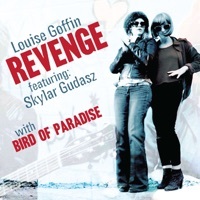 The music and visual chemistry between Goffin and Gudasz is the key of “Revenge” that creates the sense of entertainment as they deliver a relevant statement for today’s troubled world. This is the first of digital releases which represents for Goffin a return to the 45-single record complete with a flip side, a Pat MacDonald song(Timbuk3), “Bird of Paradise.” At this time, with the help of four-time Grammy winner and co-producer, Dave Way, she has completed 24 tracks, which she plans to release as singles every six to eight weeks. She has also included guest artists like Rufus Wainright, Benmont Tench and Billy Harvey. Beach Boy and Brian Wilson lyricist, Van Dyke Parks arranged and conducted orchestration for many of the songs to be released. While Goffin doesn’t rule out a future traditional album, she believes this is her best work. It is the kind of creative connection that helps to embed an artist in the soul of her audience.